​Richard Pankhurst made innumerable contributions to the history of Ethiopia. 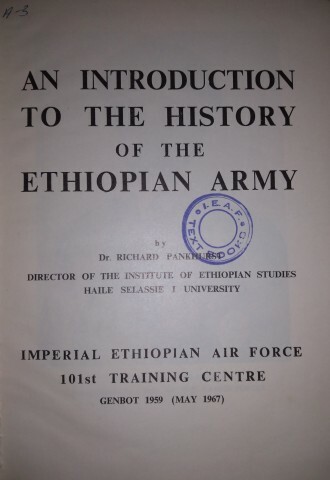 I found an original copy of "An Introduction fo the History of the Ethiopian Army", published by the Imperial Ethiopian Air Force, 101st Training Centre, in 1967. The Forward (of only 2 pages) by Colonel Aberra Wolde Mariam provide interesting insight into the thinking of the Ethiopian Military of the time, such as his comment that "no amount of technical skill and professional competence will win a war or achieve any worthwhile purpose unless it is coupled with that genuine pride and strong faith which alone is the driving force capable of stirring on to action despite insurmountable difficulties." The book is 183 pages. A small portion (p. 3-17) covers the ancient and medieval times, followed be larger chapters on the army in the nineteenth and early twentieth centuries (p. 18-60) and the history of firearms (p. 61-147). A concluding chapter speaks about the effects of war (p. 148-183). The book contains a large number of endnotes for each chapter, which Pankhurst says are largely for the benefit of students and historians who want to pursue the matters discussed in greater detail. As Pankhurst books are known for, the book is detailed and offers an immense about of detail otherwise extremely difficult to locate.